check my reference get more BLOGGER’S NOTE: This post will be shorter than the normal celebration of a Medal of Honor recipient. I am in an area with even less connectivity than I anticipated, and had to keep this to the citation and not much else. The post will be enhanced upon my return to civilization sometime on Wednesday, June 19. Richard Keith Sorenson was born in Anoka, Minnesota on August 28, 1924. After the Japanese attacked Pearl Harbor on January 7, 1941, he wanted to enlist in the United States Navy to go to war for his country, but as he was just seventeen years old, he needed his parents’ permission, which they denied. One year later, now eighteen, Sorenson enlisted in the United States Marine Corps Reserve on December 13, 1942 and after initial training at the Marine Corps Recruit Depot San Diego, was placed on active service with the United States Marine Corps‘ brand-new 4th Marine Division, then forming up and preparing for war at Marine Corps Base Camp Pendleton. Sorenson was assigned to Company M, 3rd Battalion, 24th Marine Regiment as an infantryman. The 4th Marine Division spent extra time in training as they would depart the United States direct for a landing on an opposed shore. They sailed from California in January 1944. Their destination: Kwajalein Atoll in the Marshall Islands. The attack was codenamed Operation FLINTLOCK, and began on January 31, 1944. As part of 3/24 Marines, Sorenson landed on the Namur portion of Kwajalein’s Roi-Namur island on February 1. The next day, with victory for the Americans in sight, the Japanese defenders launched desperate counterattacks that if they wouldn’t repel the invaders, they’d cause as much damage as possible. Sorenson sought cover in a shell hole with five other Marines during one such counterattack. When a Japanese grenade landed in their midst, he selflessly covered the weapon with his own body absorb its blast and save the lives of his five comrades. 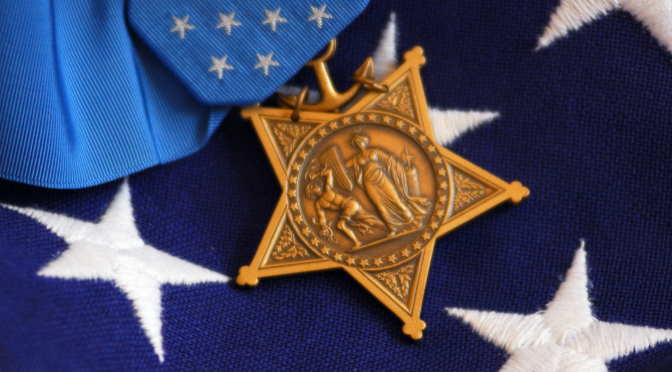 Miraculously, and largely thanks to quick first aid rendered to him by a Navy Corpsman who tied off a severed artery and stabilized his other massive wounds, Sorenson survived the grenade explosion, and lived to receive the Medal of Honor he so assuredly deserved. Sorenson endured six surgeries over nine months during his recovery. He learned that he would receive the Medal from the commander of the Seattle Naval Hospital, Captain Joel T. Boone, himself a Medal of Honor recipient for World War I. He remained in the Marine Reserves after the war, was eventually commissioned as an officer, and was recalled to active service during the Korean War, although he served entirely in stateside roles and did not see further action. As a civilian, Sorenson worked in insurance but also spent many years working with the Veterans Administration (today the Department of Veterans Affairs), retiring in 1978 as the Director of veterans’ services for Nevada and several California counties. Richard K. Sorenson passed away at age 80 on October 9, 2004 in Reno, Nevada. After memorial services there, his remains were transported back to his native Minnesota where he today rests in peace in the Fort Snelling National Cemetery, Minneapolis. No vessel of the United States Navy has ever been named for this hero from their sister service. This is once again a good time to point out that we will have a USS Gabrielle Giffords in our fleet in the coming years. The 24th Marine Regiment was deactivated in September 2013 as part of the restructuring of the 4th Marine Division. The Marines of the 24th’s 3rd Battalion were assimilated into the 3rd Battalion, 23rd Marines. Their headquarters, as reservists, are in St. Louis, Missouri. John Vincent Power, “Jack” to family and friends, was born in Worcester, Massachusetts on November 20, 1918. He spent his entire childhood there, and stayed in his hometown to study at the College of the Holy Cross, from which he graduated with the class of 1941. With the United States’ entry into World War II after the bombing of Pearl Harbor, he answered America’s call in July of 1942 with his volunteer enlistment in the United States Marine Corps Reserve. Power was sent to Officer Candidates’ School and received his commission as a Second Lieutenant on October 31, 1942. He was assigned in January 1943 to Company E of the 3rd Separate Battalion which, after transfer to Marine Corps Base Camp Pendleton in California, was redesignated as Company K, 3rd Battalion, 24th Marine Regiment as the Marine Corps swelled for combat across the far reaches of the Pacific Ocean. Power was promoted to First Lieutenant in August 1943. The 24th Marines sailed from California in January 1944 as part of the 4th Marine Division for the assault on Kwajalein Atoll. The 24th Marines were designated as the assault force for the Namur side of the Roi-Namur islands at Kwajalein. They stormed ashore on February 1, 1944 and began reducing the Japanese beach defenses to rubble and annihilating the defenders. First Lieutenant Power, commanding one of Company K’s rifle platoons, was shot in the stomach while leading his Marines forward against a Japanese strongpoint. Unwilling to give up his own attack to receive care and leave his Marines leaderless, he pressed forward until he was struck down by a second wound to his stomach and a bullet to the head while reloading his weapon. Lieutenant Power’s courageous charge rallied his Marines and saw him posthumously decorated with the Medal of Honor. Jack Power was initially buried in the 4th Marine Division Cemetery on Roi-Namur. At war’s end, his remains were repatriated to the United States and reburied in the Saint John’s Cemetery in Worcester. Power’s Medal was presented to his mother at the White House by President Franklin D. Roosevelt in November 1944; the Medal was later given to the College of the Holy Cross by his sisters. While Lieutenant Power led his charge on Namur, PFC Richard B. Anderson saved three of his comrades on Roi from a dropped live grenade. On the other side of the world, Army PFC Alton W. Knappenberger held off a Nazi counter-attack with deadly accurate fires. The Gearing-class destroyer USS Power (DD-839), named for the brave lieutenant of Roi-Namur, Kwajalein, served with the United States Navy from September 1945 to September 1977. The ship was later sold to the Taiwanese Navy and served with them until November 2005. The entire 24th Marine Regiment was disbanded in 2013 and its battalions reallocated to other components of the present 4th Marine Division in the Marine Forces Reserve.